It's been a warm and wonderful spring here and with the help of our amazing team of volunteers we've been making great progress in the gardens. We welcome Chris Mallorie, Abi Ryder and their son Ed to the team, and a short but sweet visit from Chris Kirby-Lambert who has been checking out the invertebrates in the gardens as part of our biodiversity study. So here's what we've been up to since the last post. The focus this week has been on planting out, taking advantage of the cooler weather and rainy periods that provide great conditions for new plants to settle in. 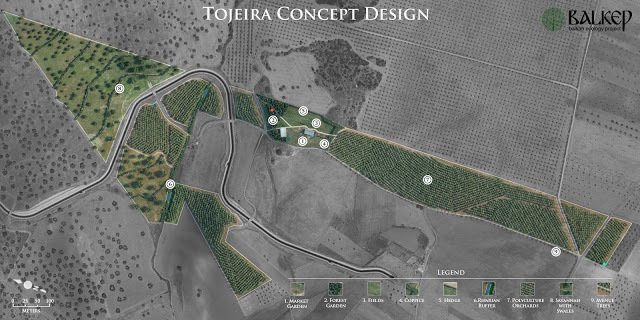 This year we decided to grow the majority of our warm season crops in flats. The main reason for this decision was that during the last two seasons we experienced some prolonged cool and wet periods during the spring and many of our bean and squash seeds sown directly rotted in the ground. The results are pleasing so far, with the germination rates in the flats well above 70% and the monitoring process made easy by all the seedlings being in a concentrated area. Some crops such as turnips, swedes, parsnips, beetroots and carrots really don't appreciate being moved, so we sow these directly into the beds. Below you can see a strip of a bed cleared for sowing turnips that will benefit from the shade cast by the Paulownia tomentosa tree saplings. The Paulownia serve as "living shade umbrellas" and also provide good quantities of mulch for the beds, and being nitrogen fixers should not be competing with the crops. Ares - Paulownia tomentosa grown as living umbrellas and mulch makers with Parsley on the left in the 2nd year, kept cut short to prohibit flowering. On the right of the Paulownia you can see a line of turnips just sown. We'll also add some dwarf beans into this polyculture at a later date. Other crops such as kale, broccoli, kohlrabi and chard come out of their seedling beds and are transplanted into the main beds. There is not too much produce coming out of the gardens in April. Garlics sown in November can be harvested green and are always a favorite, and our perennial vegetables do contribute a significant amount of produce for the home kitchens. Plants such as Asparagus - Aspargus officinalis , Garlic Chives - Allium Tubersosum, Walking Onions - Allium cepa proliferum, Turkish Rocket - Bunias orientalis , Parsley - Petroselinum crispum (biennial) and local plants such as Heracleum sphondylium - Hogweed and Ficaria verna - Lesser Celandine (needs cooking otherwise poisonous) to name but a few are all reliable edibles from March onward. At the beginning of the season we are really busy in the bionursery sending plants out to customers and preparing plants for the following season. Our market for vegetables is very small (but growing) and it does not make economic sense to invest in earlier production at the moment. Saying that, as our customer base grows it seems almost inevitable that we will find a suitable spot to set up a few tunnels in the future. In order to step up the perennial vegetable production we established a new bed in the forest garden planting a combination of Asparagus, Chinese Chives and Strawberry. We'll add an Echinacea purpurea trim around the edge and a few Loganberry bushes in the near future. First step we cut the existing vegetation down and piled it next to the bed for mulch. We wait until mid spring before cutting the existing vegetation especially if it consists of hollow stems used by beneficial insects to lay eggs in. This gives the eggs a chance to hatch and move on to do their work in the garden. Gabriele cutting the existing vegetation down to ground level with a machete, the perfect tool for the job. Next we forked over the area to relieve compaction and remove deep rooted plants that will easily grow through a mulch and following this we tilled the area with a Rototiller . We could have applied sheet mulch directly on top of the existing vegetation and planted in the autumn, but we had Asparagus seedlings that needed planting out so decided to go this route instead. There will probably be more weeding to do in the first year this way and we will loose some of the great natural soil structure, but it will recover by this time next year and this will be the last tilling this bed sees for a 1/4 of a century if not longer. The bed area is already quite fertile as it has been fallow for the previous 5 years with regular harvesting for hay, so we did not add any blanket application of compost. Area rototilled using a Honda Mantis handheld machine. It took around 2.5 hrs and 300 ml of fuel to clear the area . The large clods with roots were removed by hand as they quickly clog up the tiller. We then established the access and water channels which consist of paths/irrigation channels on either side of the bed and two keyhole paths in the wider sections of the bed. The bed is kinda pear shaped (literally). We are flood irrigating this bed using a diverted mountain stream that runs along the pathways. Capillary rise draws the water into bed and gravity draws the water down. With the keyhole paths in place we can expect thorough infiltration of water into the bed and around the roots of the plants. Next step is planting out. The asparagus were spaced approx. 45 cm apart and Chinese chives were planted in between the asparagus on the south edge of the bed. 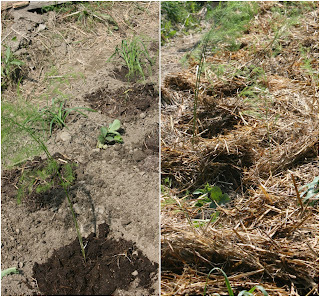 We then placed strawberry runners among the asparagus, the idea being to provide a ground cover and bee fodder but I'm sure we'll get a few strawberries too :) The shallow rooted strawberries (no more than 20 cm) should not compete with the deep rooted asparagus, the roots of which may reach depths of up to 2m. The garlic chives root in clumps around 30 - 40 cm deep. Finally we top dressed each asparagus and Chinese chive with 2L of compost, watered each plant well and mulched in between the plants. A cold snap in mid April caused some damage to fruit blossoms in the forest garden and to the new herbaceous growth on the Paulownia trees but it looks like many of the fruit trees had already been successfully pollinated and fertilised before the cold weather hit. Sub zero temperatures during the blossoming phase can destroy the sexual organs of the plants and destroy the pollen grains reducing fruit set considerably, and in some cases absolutely. Selecting cultivars that flower after the last expected frosts in your region can safeguard against this. We are growing early, mid and late flowering/fruiting cultivars of most of our fruit trees so each year regardless of weather anomalies we can be sure we have some fruit. Necrotic patches on the Paulownia tomentosa caused by a cold snap in mid April. New leaves soon emerge and no serious damage is done. It was a pleasure to be joined by Christopher Kirby-Lambert in early May. Chris a self employed ecological surveyor has been looking at the range of the invertebrates we have in the garden mainly focusing on bees and beetles. Chris checking the sweep net. We're hoping Chris will help us establish a methodology for a multi year survey to shed some light on how our garden practices are influencing biodiversity and vice-versa. Chris spent time surveying our 4 year old market garden and the new perennial polyculture trial garden we started to develop this year - Ataraxia. We're looking forward to seeing the results. We are experimenting with growing Comfrey 'Bocking 14' in the market garden for mulch and liquid fertiliser. Last year we started to weigh the annual harvest from our 13 m2 trial bed . You can read about the last year's trials and the results here and if you would like to find out how to set up a comfrey patch check out our post here. The first cut this year weighed in at 20.40 kg from 13m2. The results this year are taken from a sample of 14 plants, the average weight of one plant is calculated from the sample and multiplied by 42 (the total number of plants in the bed). This is a decrease from last year's 1st cut of 23.39 kg. The only fertility the bed has received since we began records is from grass trimmings and the leftover sludge from making comfrey tea (comfert). 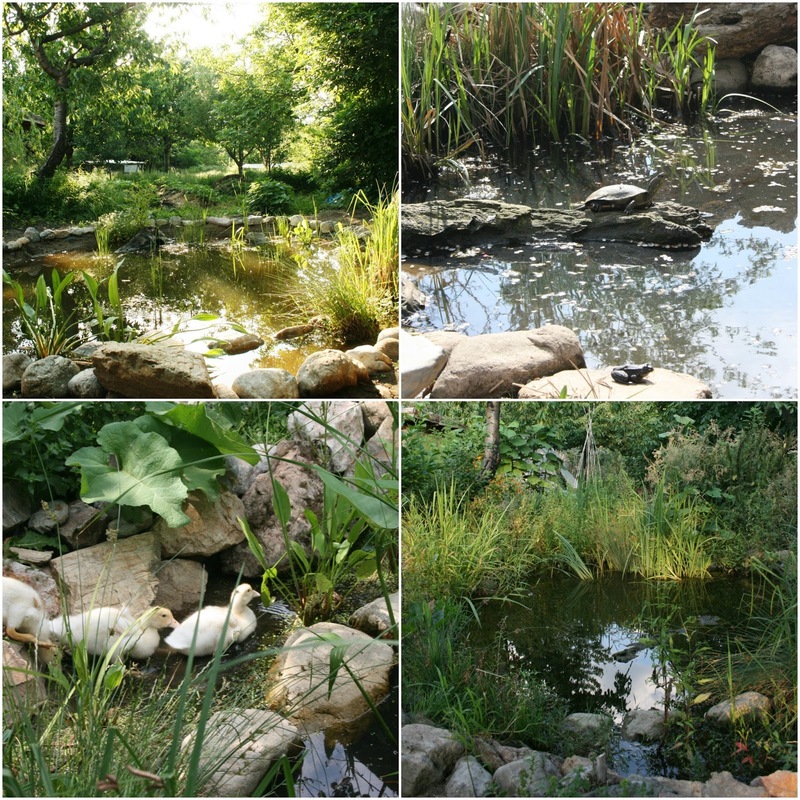 We've also been busy installing ponds in our new perennial polyculture trial garden as well as in Catherine Zanev's Permaculture Farm in North Bulgaria. 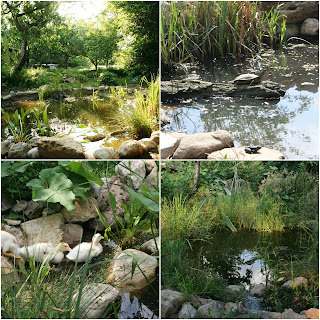 You can read more about our pond installations in this blog post here.